Mon., June 6, 2016, 9:50 p.m.
Thursday: San Jose at Pittsburgh, 5 p.m.
x-Sunday: Pittsburgh at San Jose, 5 p.m.
x-June 15: San Jose at Pittsburgh, 5 p.m.
SAN JOSE, Calif. – The Pittsburgh Penguins were confident that three straight games without a point for Evgeni Malkin and a rare off night by Matt Murray were an aberration more than a concern. Bounce-back performances from those two key players moved the Penguins to the brink of winning the Stanley Cup. Malkin scored one goal and assisted on another, Murray made 23 saves and the Penguins took a 3-1 series lead in the Stanley Cup Final by beating the San Jose Sharks 3-1 on Monday night. Malkin helped set up Cole’s goal to open the scoring, then added one of his own on the power play to give Murray all the support he needed. Eric Fehr sealed it with a late goal after San Jose made a strong push in the third. Two nights after allowing a soft game-tying goal to Joel Ward, Murray was steady throughout to put the Penguins one win from skating off with their fourth Stanley Cup in franchise history. They can do it at home in Game 5 on Thursday night. The Sharks were unable to build on their first win in the final, allowing the first goal for the fourth straight game and going more than nine minutes without a shot on goal during one stretch of the second period. 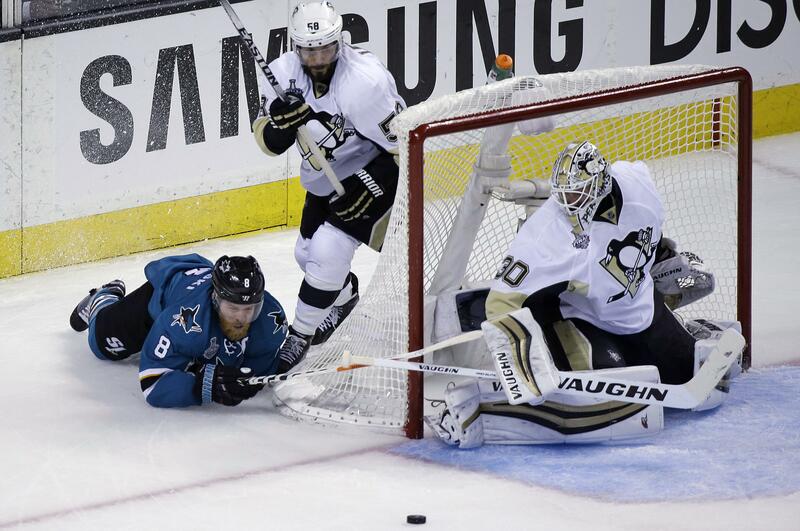 San Jose has yet to lead at any point in the series other than after scoring in overtime in Game 3. Melker Karlsson scored the lone goal and Martin Jones made 17 saves for San Jose. The Sharks will now need to win in Pittsburgh to give their loyal fans who waited 25 years to watch the Stanley Cup Final in the Bay Area another home game. No team has come back from a 3-1 deficit to win the final since Toronto did it in 1942 against Detroit. The story for the Penguins after their 3-2 overtime loss in Game 3 was how to get Malkin going after a slow start to the series. And how would the rookie Murray respond after giving up the soft goal to Ward and the winner to Joonas Donskoi. Both passed with flying colors. Malkin was energized from the start, helping set up the first goal when he caught San Jose on a bad line change and sent Phil Kessel in on a rush. Jones stopped Kessel’s shot, but Cole knocked in the rebound for his first career playoff goal. Malkin then got his goal when he tapped in a perfect pass from Kessel for Pittsburgh’s first power-play goal of the series. Murray wasn’t tested often early and went nearly the first half of the second period without facing a single shot. The Sharks made a strong late push, and he robbed Couture, left all alone in the slot after a turnover by Kris Letang, late in the second. Murray then stopped Patrick Marleau on a breakaway and saved a one-timer by Joe Pavelski early in the third before allowing his first goal. Karlsson beat him on a rebound of Brenden Dillon’s point shot with 11:53 to play. But Murray didn’t flinch and came up big again against Pavelski, keeping the NHL’s leading goal scorer this postseason without a point in the final. Fehr provided the insurance when he beat Jones on an odd-man rush with 2:02 to play. Published: June 6, 2016, 9:50 p.m.